A rich and creamy salad thanks to a little Mediterranean twist! This is another one of my other favorite go-to salads after a long day at work. As I have cucumber in my fridge pretty much all the time anyways, I can whip this up in no time. A healthy satisfying meal that surely doesn’t break the bank or the waistline. 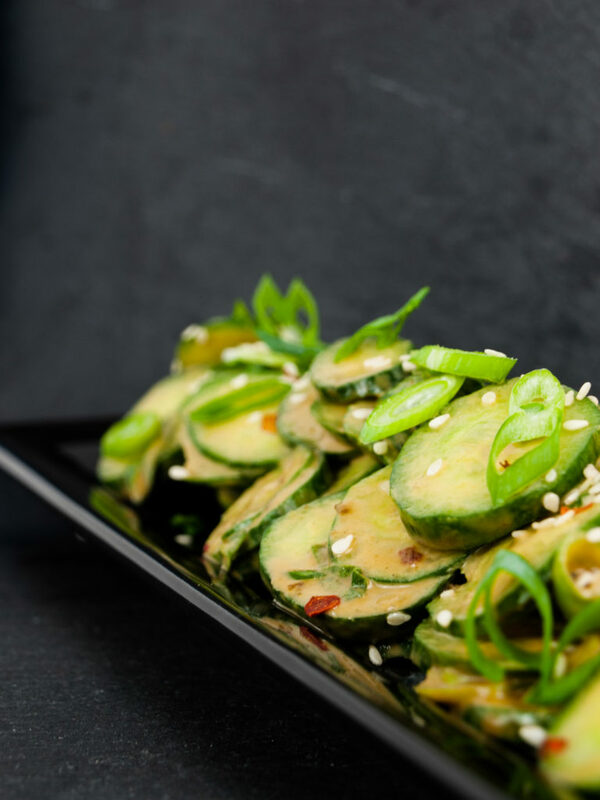 Traditional Korean cucumber salads often use sesame oil and seeds. To make this somewhat unique and exceptionally delicious I decided to go somewhat off the beaten track and introduce an ingredient from the Mediterranean. Tahini is a thick sesame paste that gives a very rich and creamy mouth-feel to any dish. You may probably know this as one of the ingredient in your favorite hummus recipe as well. Next to that I like to use the thick syrupy Indonesian soy sauce Ketjap Manis instead of regular old soy sauce. It has some sweetness to it, as well as light sticky consistency that helps to coat the cucumber without running off again immediately afterwards. When it comes to the cucumber itself, I’d prefer pickling cucumbers over the regular sized ones in this dish. The main reason is that pickling cucumber are smaller, firmer, have less seeds and are less watery. These may be called gherkins (I mean fresh ones, not the pickled ones from the glass! ), or Korean, Japanese, Persian or Kirby cucumbers, depending on where you live. The salad can be eaten as a main dish or as a side alongside some other Asian treats. 3 easy steps – spicy creamy cucumber salad is right around the corner! Thinly slice the cucumber (about 1mm thick), either with a knife or with a mandolin. Cut the spring onion into slices as well. Combine the tahini, ketjap manis, rice vinegar and sambal badjak into a creamy dressing. Sprinkle on the sesame seeds and enjoy your creamy explosion of flavor! Let me know what you think about the recipe in the comments below! Think this recipe is so unauthentic that I shouldn’t call it Korean at all? Do you like the creaminess of the tahini in the recipe? As always, all comments are appreciated underneath!